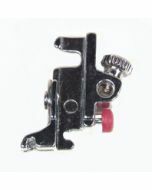 The Janome Even Feed Foot with Guide has a moving feed system that holds and moves the fabric between the presser foot’s upper feed dog and the machine’s lower feed dogs to better control difficult fabrics as well as multiple layers of fabric. 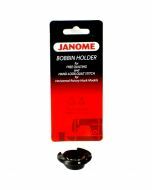 Use the Janome Even Feed Foot when quilting striaght lines, matching prints or plaids while sewing, or when fabric shifting is an issue. 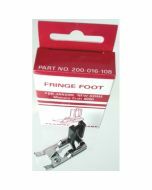 Walking foot is another name fot the Even Feed Foot. 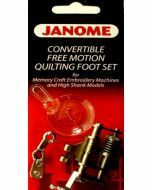 The Janome Even Feed Foot is not meant to be used when sewing in reverse or side to side as well as when sewing some built in stitches that include other than forward movement of the feed dogs. 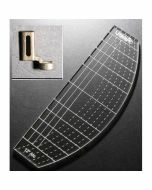 Also great for topstitching which can be inconsistent due to irregularity of stitching or by the bulk created with the seam allowance especially around collars and reveres. 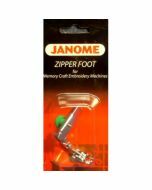 Using the Janome Even Feed Foot for topstitching will eliminate this problem and give perfect stitching every time. This is for High Shank Embroidery Machines.